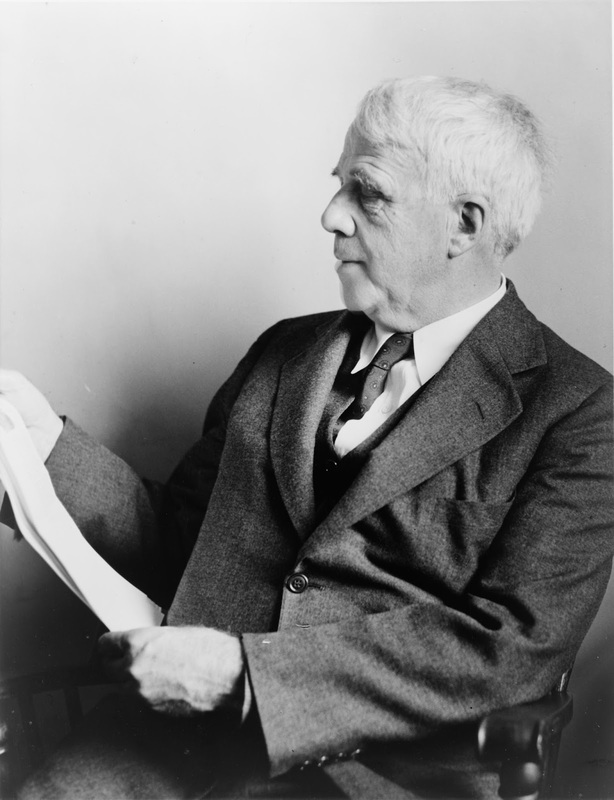 Robert Frost was born in San Francisco on March 26, 1874. He moved to New England at the age of eleven and became interested in reading and writing poetry during his high school years in Lawrence, Massachusetts. He was enrolled at Dartmouth College in 1892, and later at Harvard, though he never earned a formal degree. Frost drifted through a string of occupations after leaving school, working as a teacher, cobbler, and editor of the Lawrence Sentinel. His first professional poem, "My Butterfly," was published on November 8, 1894, in the New York newspaper The Independent. In 1895, Frost married Elinor Miriam White, who became a major inspiration in his poetry until her death in 1938. The couple moved to England in 1912, after their New Hampshire farm failed, and it was abroad that Frost met and was influenced by such contemporary British poets as Edward Thomas, Rupert Brooke, and Robert Graves. While in England, Frost also established a friendship with the poet Ezra Pound, who helped to promote and publish his work. By the time Frost returned to the United States in 1915, he had published two full-length collections, A Boy's Will and North of Boston, and his reputation was established. By the nineteen-twenties, he was the most celebrated poet in America, and with each new book—including New Hampshire (1923), A Further Range (1936), Steeple Bush (1947), and In the Clearing (1962)—his fame and honors (including four Pulitzer Prizes) increased. Though his work is principally associated with the life and landscape of New England, and though he was a poet of traditional verse forms and metrics who remained steadfastly aloof from the poetic movements and fashions of his time, Frost is anything but a merely regional or minor poet. In a 1970 review of The Poetry of Robert Frost, the poet Daniel Hoffman describes Frost's early work as "the Puritan ethic turned astonishingly lyrical and enabled to say out loud the sources of its own delight in the world," and comments on Frost's career as The American Bard: "He became a national celebrity, our nearly official Poet Laureate, and a great performer in the tradition of that earlier master of the literary vernacular, Mark Twain." About Frost, President John F. Kennedy said, "He has bequeathed his nation a body of imperishable verse from which Americans will forever gain joy and understanding." Love is an irresistible desire to be irresistibly desired. If we couldn't laugh we would all go insane. The best way out is always through. I am not a teacher, but an awakener. Poetry is when an emotion has found its thought and the thought has found words. A mother takes twenty years to make a man of her boy, and another woman makes a fool of him in twenty minutes. You're always believing ahead of your evidence. What was the evidence I could write a poem? I just believed it. The most creative thing in us is to believe in a thing. A liberal is a man too broadminded to take his own side in a quarrel. A good book has no ending. A civilized society is one which tolerates eccentricity to the point of doubtful sanity. You've got to love what's lovable, and hate what's hateable. It takes brains to see the difference. A bank is a place where they lend you an umbrella in fair weather and ask for it back when it begins to rain. Families break up when they get hints you don't intend and miss hints that you do. The reason why worry kills more people than work is that more people worry than work.